INDIANAPOLIS (CNS) — Abby Johnson’s life had already become an open book. Soon it also will become a national box office show. Johnson, 38, is a former pro-choice Planned Parenthood facility director turned national pro-life advocate. She made the comments March 14 during a webinar about the film “Unplanned,” which is based on her 2011 book of the same name. Joining her on the webinar were Archbishop Joseph F. Naumann of Kansas City, Kansas, who is chairman of the U.S. Conference of Catholic Bishops’ Committee on Pro-Life Activities, and Vicki Thorn, executive director of the National Office of Post-Abortion Reconciliation and Healing and founder of the Project Rachel post-abortion ministry. “I looked at Doug and said, ‘Is it too late? Can I back out?’ I felt so exposed, especially the scene with my RU-486 (chemical) abortion,” Johnson said. “I had to remind myself that I didn’t sign on to do this film to make ‘Abby Johnson’ a household name. I signed on to truly amplify God and make him a household name and show his redeeming power. None of this is about me. This is his story,” she said emphatically. Johnson’s story of God’s redemption in her life began to unfold in September 2009. Johnson, then one of Planned Parenthood’s youngest facility directors, was called in to assist with an abortion. What she saw on the ultrasound convinced her that what she’d been told about abortion — and what she’d repeated to women for nearly 22,000 abortions under her watch at Planned Parenthood — was grossly wrong. But she didn’t say yes to just anyone to share her story on film; she turned to Chuck Konzelman and Cary Solomon, both devout Catholics with years of experience in the film industry. Konzelman and Solomon co-produced, co-wrote and co-directed “Unplanned,” which is being distributed by Pure Flix. “Unplanned” provides an opportunity not just to observe compassion, but to experience it as well. At the end of the film, Johnson said, a number will appear on the screen. “So if a woman is in a crisis pregnancy, needs help after an abortion, if a man needs post-abortion help, if someone works or worked in the (abortion) industry — there will be help for them right after the film … staffed 24/7,” she explained. Archbishop Naumann also pointed out the film’s depiction of the positive role that pro-life sidewalk counselors played in Johnson walking away from the abortion industry. So far the ministry has “helped almost 500 people leave their job, find Christ and get into our program with therapy that can help them,” she said. The film has provided Johnson a second way to reach abortion workers. 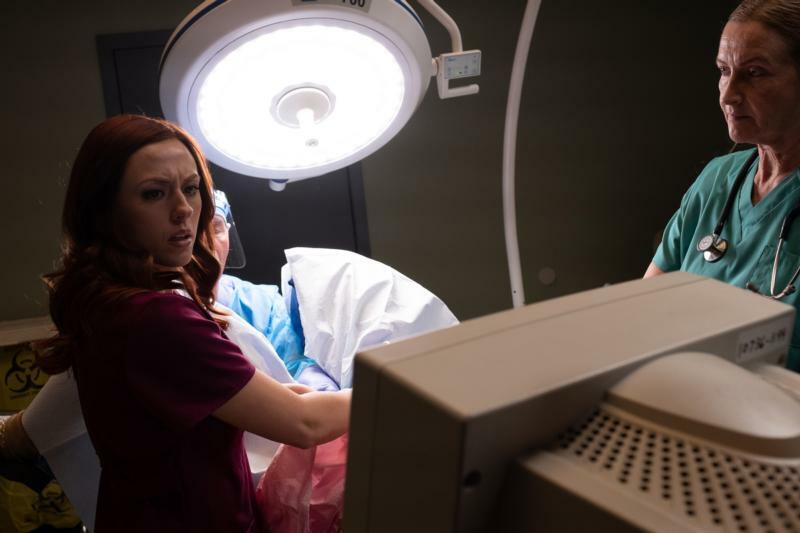 She purchased and is mailing tickets for “Unplanned” to abortion facilities near theaters showing the film. She’ll include a letter inviting feedback on the movie. He also encouraged priests to be upfront about one thing: the film’s rating. Archbishop Naumann noted two ironies about the film’s rating. “I’ve heard parents say they don’t want to expose their kids to abortion. We performed abortion on girls as young as 10 and 11,” she continued. “You’re not doing your children any favors by sheltering them from abortion and not having these conversations. “I think this (film) will really change the dialogue about abortion in this country,” Johnson concluded. “For far too long people haven’t really known how to talk about abortion. People are scared of the topic. They don’t know what to say, so they don’t say anything. Editor’s Note: More information about “Unplanned” can be found at www.unplannedfilm.com.